So, we’ve reached the finish line of the marathon month that was the AW18 show season, and between New York, London, Milan and Paris, a hell of a lot went down (seriously, there was so much fashion). So no problem if you couldn’t quite keep up with all of it. Among some of the standout moments was the long-awaited announcement from Simon Porte Jacquemus on what his ‘new job’ was – coming out for the finale at his AW18 show, the designer wore a sweatshirt with the message: “New job L’Homme Jacquemus”. If you aren’t fluent in French, he’s branching out into menswear. A first look at that will be coming in June. In London, Christopher Bailey waved goodbye to Burberry after 17 years at the helm of the brand with a rainbow check-smattered collection dedicated to LBGTQ+ communities around the world. Two weeks after the show came the news that Riccardo Tisci – previously of Givenchy – would be replacing Bailey and presenting his debut collection in September. While we wait for those firsts, here’s one we already got to enjoy – last year’s LVMH Prize winner Marine Serre made her PFW debut, presenting a collection that explored form, function and protection. That wasn’t even the half of it though. There won’t be a test, but you know, just in case someone at the busstop strikes up a conversation about Gucci dragons. We got you. That’s right. No other than Her Majesty the Queen made a surprise appearance on the FROW at Richard Quinn’s AW18 show. Why? She was there to present the designer with the first ever Queen Elizabeth II Award for British Design. Who better to sit her next to than the Queen of Fashion – Anna Wintour. The collection, which saw models wear motorcycle helmets with matching silk scarf gowns, was evidently fit for a queen in the truest sense of the phrase. Come back again next season? Even if you’re not among the travelling fashion crowd doing the fashion month circuit, you can be sure that you’ll see everything going on from the comfort of your own home via the ‘gram. 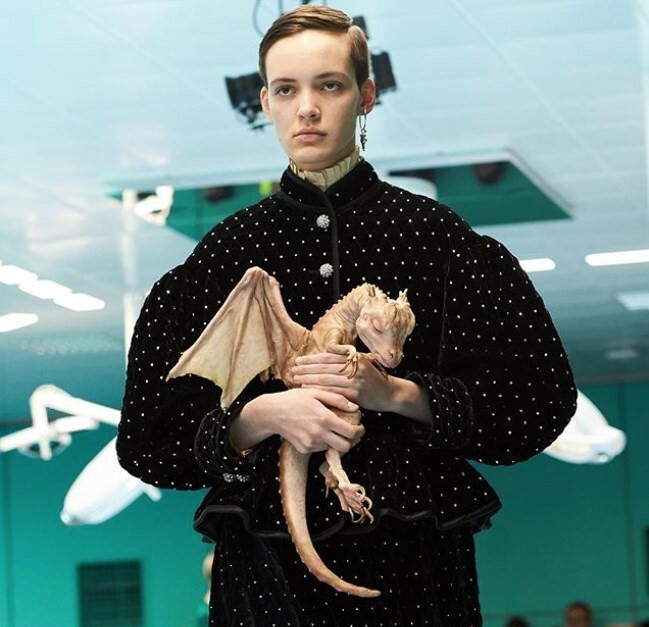 At Gucci, two models also walked the runway clutching eerily lifelike renderings of their own severed heads, courtesy of special effects company Makinarium. Others carried pet accessories in the form of a chameleon, snake, and a baby dragon (as you do). At both Gauntlett Cheng and Tod’s IRL dogs joined model’s on the runway. And if that wasn’t enough to break the internet, Tommy Hilfiger and Gigi Hadid’s final collab collection – and finale walk together – was all over IG Stories too. This season's celebrity casting cameos included Elle Fanning, who opened and closed Miu Miu, and Stranger Things star Sadie Sink, who made an appearance at Undercover. Elle Fanning has long donned Miuccia Prada’s designs, and as she has even starred in a couple of the label’s campaigns, so she must’ve felt right at home switching up the red carpet for a runway. And as a star of the most popular science fiction-horror series of our times, Sadie Sink fitted right in at Undercover, a brand that is known for its conceptual, sometimes creepy presentations – see last season’s The Shining theme. This season we saw a black model open Prada for the first time since Naomi Campbell did in 1997 – thanks to social media. Anok Yai garnered attention online when a photographer discovered her at a music festival, and the rest is history. Cara Delevingne made an unexpected return to the runway for Burberry, (clad in a big gay rainbow cape, no less) in order to send off Christopher Bailey, who has now stepped down from his long-held position. To mark his exit, Bailey redesigned the iconic Burberry check to incorporate the rainbow flag, in a showing of support for LGBTQ+ communities and youth. It has now been revealed that Riccardo Tisci will become Burberry’s new chief creative officer. Grandiose sets were standard – Balenciaga erected a graffitied snowy mound a la Salvation Mountain and Chanel countered with a larger than life forest for its models to parade around. Not forgetting Gucci, whose alien charged affair took place in a fluorescently lit surgery theatre. And that’s not all – Dior had 150 people working for three weeks to put together it's paste-up protest at the Musee Rodin, and Calvin Klein carpeted its show space in popcorn – which had the unfortunate consequence of ruining Suzy Menkes’ shoes. And no, we’re not talking about Dior AW03. One anti-fur protester managed to storm the runway at Mary Katrantzou (a designer who has vowed to never use fur anyway). This season there was an ever increasing presence of animal welfare activists outside shows – stationed outside Marc Jacobs in New York, and lining the street outside the BFC show space for the majority of LFW. The number of designers who actually used fur was minimal, but that didn’t seem to stop ‘em. Specifically, Saturday March 3, which featured shows by Junya Watanabe, Comme Des Garçons and Noir Kei Ninomiya, as well as Vivienne Westwood (who threw a riotous show featuring club kid gogo dancers) and Hermès. Experimental styling mixed with classic tailoring made Junya’s “no theme” show a delight, while Noir Kei Ninomiya was unforgettably eclectic, with its wildly technical constructions, voluminous shapes and flower face masks. And to round everything off, Comme’s expert exploration of camp and kitsch via its mainstay of oversized silhouettes was awe-inspiring.